This delicious gluten-free and dairy-free buttermilk fried chicken is irresistible! Make dairy-free buttermilk - Mix together lemon juice, soy milk, 2 Tbsp. salt, 1/2 tsp. pepper; let sit for 10 minutes. 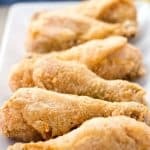 After 10 minutes - in a large bowl, add buttermilk and all chicken pieces and allow to marinate for at least 2 hours in the refrigerator, mixing a few times. Take a brown paper bag (or double bag plastic bags) - add flour, 1 Tbsp. salt, 1/2 tsp. pepper, and paprika. Mix well! Add chicken to bag (in 3 or 4 piece batches) and toss well until fully coated. Place chicken on a sheet of parchment paper and allow to sit until coating has a paste-like consistency. Heat oil to 400F in electric skillet until hot. Add as many pieces as skillet can hold. Then once back up to temp, reduce heat to 350F and cook (turning occasionally) until crispy and golden brown on all sides. About 30 minutes. Remove chicken onto paper towels and allow to drain and cool for about 10 minutes. Then, if needed, transfer to a warm oven.